TonerTopUp supplies toner refills for laser printers, fax machines and copiers from the UK. We supply bottles of toner and laser printer refill kits to make refilling cartridges easy. Laser toner cartridges can be simply refilled several times to save you money. Environmentally friendly! We supply HP Hewlett Packard Brother Canon Epson Lexmark Konica Minolta QMS OKI Samsung Xerox laser refill toner and many other types! 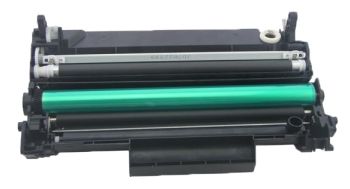 The Continuous Supply Toner Cartridge for HP CE285A is specially designed for refilling. Refilling is very easy and clean, just like replacing a new one. It has a filler opening so there is no need to disassemble the cartridge or melt a hole. Simply pour more toner in. No tools are needed, and there is no mess. It can be used six to eight times. 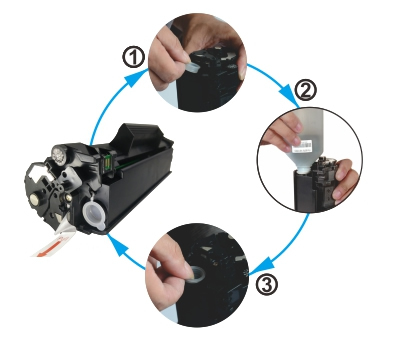 The cartridge is supplied with five bottles of toner - equivalent to six replacement cartridges. It yields more than 12,000 pages at 5% coverage. There is no need to empty the waste toner or replace the chip. Simply pour more toner inside. 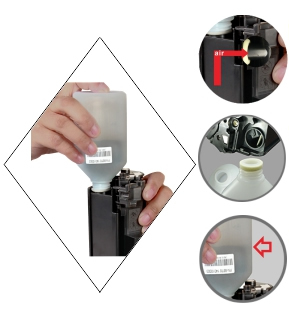 The toner bottles have a foam seal so there is no leakage. 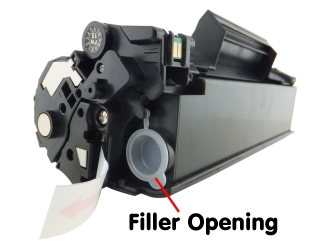 The cartridge has a special internal structure so the air can escape whilst pouring the toner in. The waste toner chamber and chip have been specially designed for reuse. The waste toner is automatically recycled, so it never overfows and damages the imaging drum. The CTSC parts have been specially selected from the industry's top suppliers. It offers excellent print quality. Not only this but the service life is very long, to ensure it lasts the full six to eight cycles lifetime. Super durable with excellent print quality! Achieve the maximum possible environmental benefit. By reusing your CTSC 6-8 times you are reducing consumption of raw materials and saving landfill waste. Never full, and never leaks! 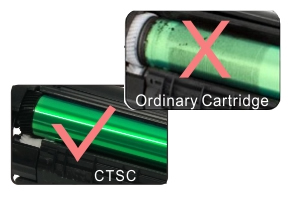 With the CTSC you can save around 50% of the cost of buying replacement cartridges. Furthermore with the CTSC you only buy it once. There is no need to keep reordering. Save space in the office, and 83% less time spent ordering more office supplies..
Real green print, really eco-friendly! Don't hesitate - go green today!